Composites not only play an important role in electrical engineering. In aeroplane- and vehicle construction, materials with a high glass- or carbon fibre content achieve optimum energy efficiency due to their extraordinary strength and low weight. Fibre-reinforced polymers are used in a wide variety of sectors. Particularly in electrical engineering, but also in vehicle interiors and exteriors, engineers use these materials with their high content of glass or carbon fibres. Fiber-Line tools perfectly meet the high requirements for service life, surface quality and cutting quality. In 2013 and 2014, in the European Benchmark Test by the Technical University in Vienna, our tools were awarded 1st prize. We provide various tools for the milling and drilling of a large number of CFRP/GFRP materials, organic sheets, GMT, SMC, LFI and LFT. They provide geometries with different orientations in order to deal with the diversity of materials. A prominent characteristic of drilling and milling tools by HUFSCHMIED is that they are specifically configured for ”cold” machining with their chip geometry and sharp homogenous flute edges. All tools are made from special hard metals, optimised for the wear mechanisms that are present in fibre-reinforced polymers. Special chip breaker geometries for reduced cutting forces decrease procedural stresses and heat to the extent that there is no delamination, fraying or fibre protrusion. HUFSCHMIED provides a wide range of standard catalogue tools in various dimensions. Our team will also be happy to support you in finding tailored solutions for the machining of composites. Furthermore, optimised milling programs will achieve cost-efficient processing for every sector. Carbon fibre material and CFRP, respectively, are the number one lightweight material. In racing sports, CFRP has been indispensable for years. The automotive industry also uses the potential of these ultralight, extremely strong and versatile carbon fibre composites. For some years, carbon fibre and CFRP have been successfully used in aviation. Primarily, aeroplane manufacturers are having to solve problems concerning energy-saving and CO2 emissions. Lightweight construction with high-rigidity components made from carbon offers phenomenal possibilities together with fulfilling the stringent safety requirements of the aviation sector. Different production methods together with the pronounced diversity of both fibre and matrix allow for force-flux-compliant components. Functional integration also plays an important role. High-strength carbon fibres, alternating with a soft matrix in CFRP, pose specific challenges when machining this material. Accurate machining is also complicated by the different properties displayed, depending on which angle the cutting wedge engages with the fibre. Special process-optimised milling cutters and machining tools are therefore necessary in order to achieve clean-cut edges without the need for post-processing. HUFSCHMIED provides the largest standard tool range for the economic machining of CFRP. 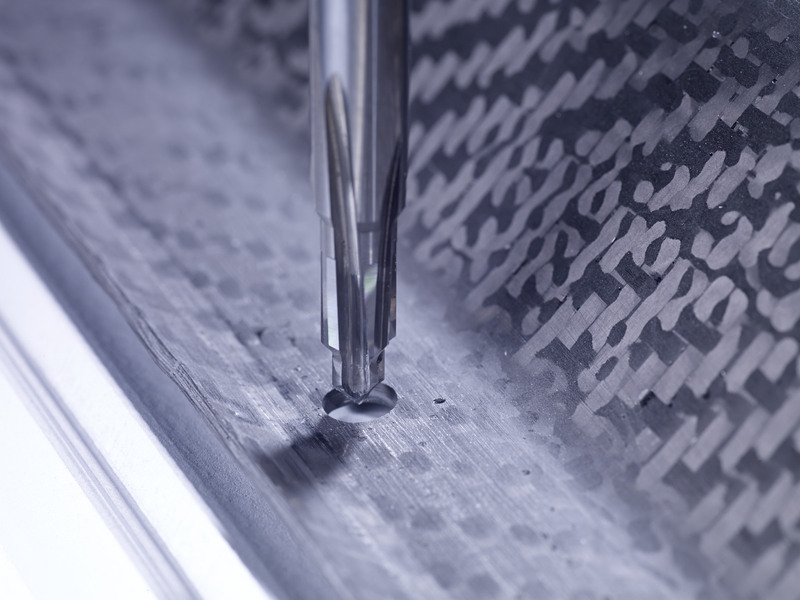 In particular, HEXA CUT and T‑REX tools achieve top results when milling carbon fibre materials. Glass-fibre-reinforced polymers (GFRP) play an important role, particularly in the aerospace industry, in racing sports and in the automotive industry. Furthermore, the electrical insulation of wind turbines is often made from GFRP. GFRP is both very stable and very abrasive. For the processing of this material, nothing less than hard metal will suffice; better still are tools equipped with diamond blades. Apart from choosing the right tool, it is equally critical to select a suitable geometry and to specify optimum cutting parameters. HUFSCHMIED tools allow the efficient and economical milling and drilling of GFRP without delamination and chipping. For this task, our tool range includes pyramid-toothed routers and PKD tools. These are perfectly adapted to the heterogeneous layer structure of fibre-reinforced composites and provide best results without post-processing. HUFSCHMIED offers the largest standard tool range to economically process glass-fibre-reinforced polymers. Honeycomb materials are mainly used in the aerospace sector, but increasingly find their way into the advertising industry and the series production of furniture. Their high rigidity together with a very low weight are characteristic. They are particularly suited to the production of fuselage floors or walls. Honeycomb is available as paper honeycomb, GFRP honeycomb structures or aluminium honeycomb. The material machines to a coarse powder. Comma-shape chips result from milling aluminium honeycomb. It is important that the honeycomb cells are not stripped out during processing, but are cleanly cut – both at the front end and the circumference of the milling tool. For this task, Hufschmied provides Hexa Cut PW tools for honeycomb material with cover layers and FIBER-Cracker tools for honeycomb materials without cover layers. Since 2018, we also provide our WHK ultrasound blades for the cutting of honeycomb without top or base layers. Honeycomb is cleanly and smoothly cut with milling cutters, drills and ultrasound blades by HUFSCHMIED – even at very high feed rates. This lowers processing time, minimises post-processing and reduces costs significantly. WHK cutting blades are not constructed from several soldered parts, but built as a monolithic structure from carbide (VHM). This means that ultrasound oscillations can travel from the generator via the Sonotrans to the tip of the blade without notable loss and significantly higher oscillation amplitudes can be achieved. Honeycomb is thus separated cleanly and without distortions, even with high feed rates. Natural fibres are mainly used for fibre reinforcement in the automotive industry. Flax and hemp fibres, for example, are used for the reinforcement of door panels. Due to their origin in nature they constitute a renewable source of material and therefore are available as a virtually inexhaustible material for the reinforcement of polymer parts. However, due to their natural growth, their inherent parameters are more variable. Due to their variable structure, composites containing natural fibres pose higher demands on the construction of the cutting tool to achieve stable cutting processes. Furthermore, natural fibre materials are very abrasive and, when they overheat during processing, they can carbonise. Compression tools from HUFSCHMIED allow the cost-efficient processing of composites containing natural fibres and impress with their good cutting performance together with a long service life. Aramid and Kevlar® are textile fibres used for reinforcement purposes in polymer parts. Aramid and Kevlar® composites are often used in thermal protection. Apart from that, they are used, for example, in the ballistic protection of combat helicopters due to their tough, but stable properties. Reinforcement of CFRP structures and combinations with other fibres are also achieved with aramid and Kevlar® fibres; for example in the production of helmets and monocoques in racing sports. Kevlar® and aramid fibres machine into a filament that tends to splice and embrittle – similar to a woollen thread that is cut with a pair of blunt scissors. For this reason, these structures must be cut with ultra-sharp cutting tools that are also configured as compression tools. The compression or resist aspect is necessary, since a textile fibre can warp in any direction, as if trying to evade the blade. Without the necessary compression, the fibre does not get cut, but only squashed. This will result in fibre protrusions at the component which, as a rule, are not permissible. HUFSCHMIED tools with compression cuts such as type 161 and type 193, respectively, prevent the development of fibre protrusions due to their Z1+1 and Z2+2, respectively, compression geometry at the circumference. These tools achieve smoothly-cut edges and a long tool life. Synthetic fibres are mainly deployed in industry to adapt polymers to a host of requirement profiles. Ranging from viscose to rubber, the spectrum of synthetic fibres is very broad. In machining, every fibre is exposed to the tool used – just like the surrounding matrix. That implies a very wide requirement profile to be met by the tool. Our Universal-Line and Sharp-Line tools are perfectly matched to milling both the matrix and the fibre. Their sharp cutter geometries achieve a relatively cold milling process. Polished chip flutes enable high chip removal rates. This, in turn, minimises fibre protrusions and the gumming-up of material at the components. In order to increase the productivity of your company, we can support you with technical advice for the milling and machining of composites. We can analyse the requirements of your company and develop specifically tailored technical solutions for you. With our expertise and the range of options available at the HUFSCHMIED engineering center, we can optimise your manufacturing processes.